Network-attached storage (NAS) can be a wonderful thing, yet for the average consumer you could argue that many of today's NAS solutions are more complex than need be. 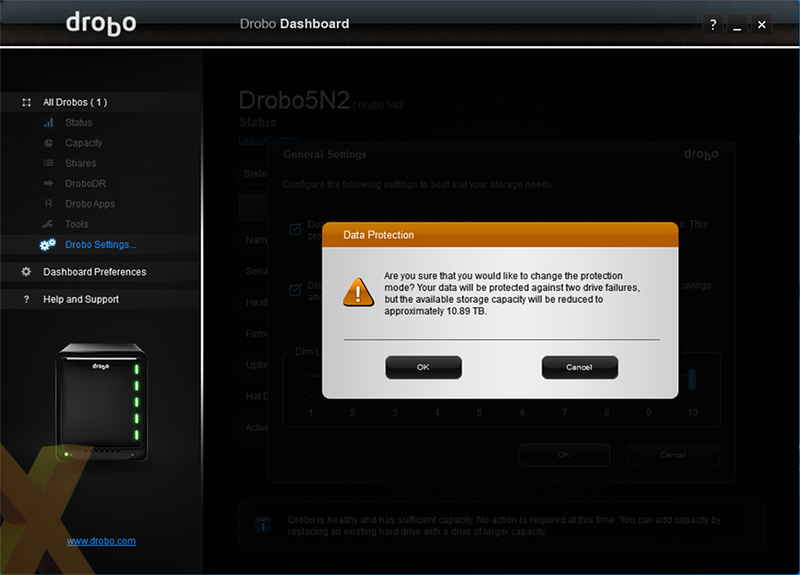 There ought to be a simpler way, and Drobo reckons it has the answer with a neat-looking box it claims is "the best and easiest to use storage solution on the market." The firm, founded in 2005 and formerly known as Data Robotics, takes great pride in its BeyondRAID technology, whose ability to strip away the complexity of traditional RAID arrays is a key selling point. Ever wished you could build an array with mixed-capacity disks? 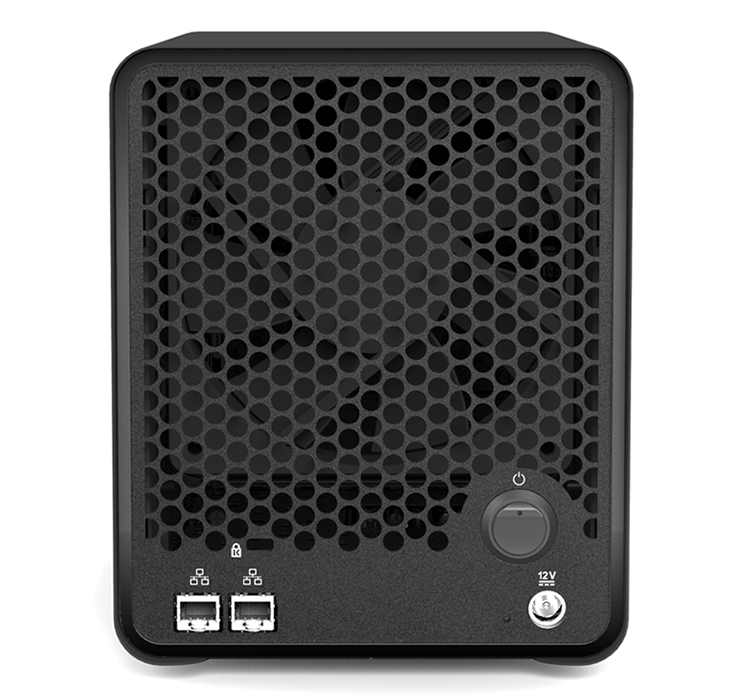 Want an easier way to expand your existing storage pool? Or perhaps you'd like to protect against drive failures without the dread of a lengthy rebuild? BeyondRAID claims to avoid the aforementioned pitfalls by monitoring data usage at the block level through a layer of virtualisation. Doing so enables BeyondRAID to choose "the correct protection algorithm based on data availability needs at any given moment," and this approach allows for a one-click switch between redundancy modes while drastically improving initialisation times. Sounds like a no-brainer, so why hasn't BeyondRAID become the industry standard? 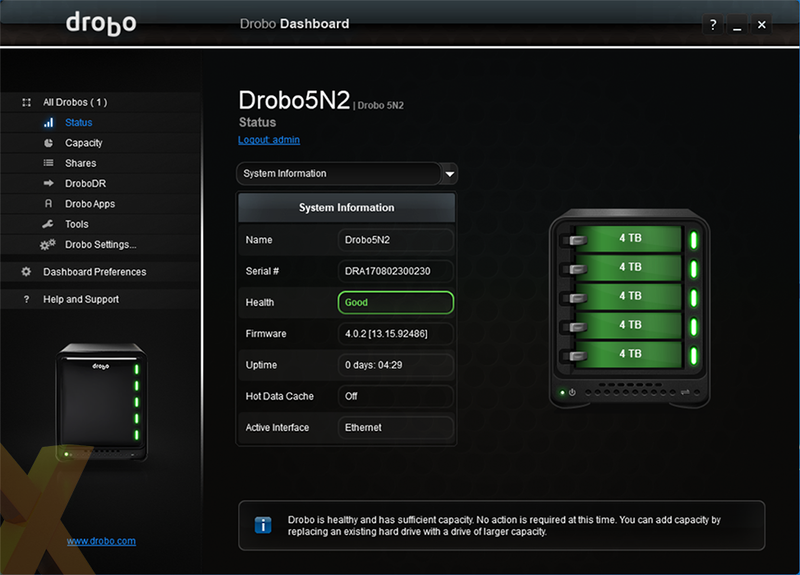 One reason is that the processing overhead of Drobo's block-level technology has historically hampered performance. 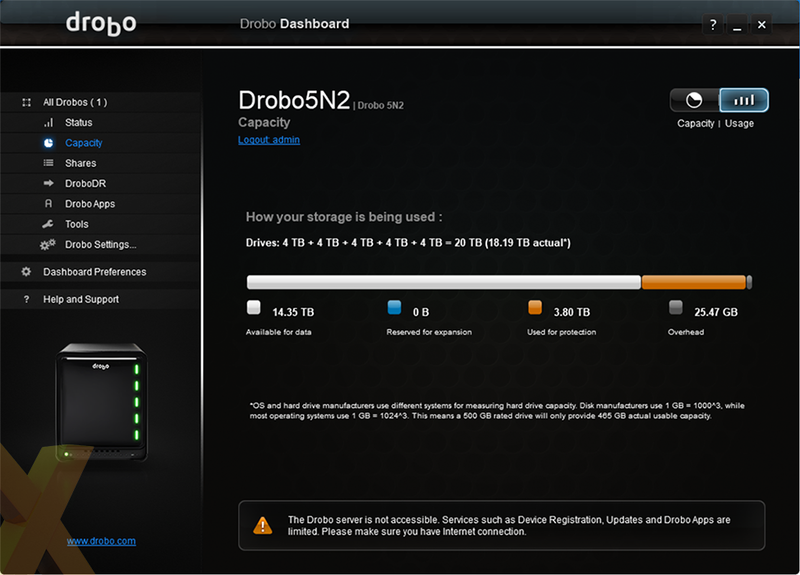 Hoping to banish that hurdle for good, the latest-generation Drobo 5N2 arrives with more-capable hardware geared toward the home enthusiast or small business. Priced at £460, the five-bay network-attached box comes equipped with a quad-core 1.6GHz Marvell Armada XP processor and 2GB of RAM, making it the quickest Drobo 5N to date. Furthering the performance potential, the back of the unit is now home to two Gigabit Ethernet ports, with Drobo finally adding port-bonding functionality for double the potential throughput. 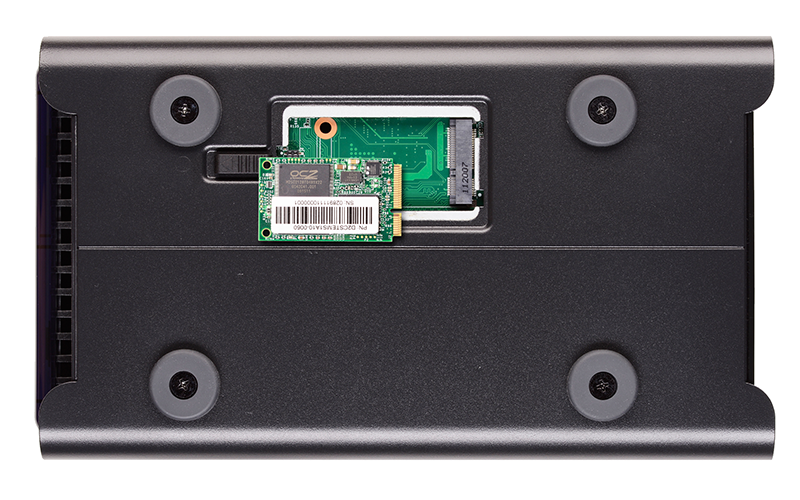 An 'accelerator bay' has been added on the underside of the 150mm (W) x 185mm (H) x 262mm (D) box, allowing for an mSATA SSD to serve as a hot-data cache, and build quality is solid throughout. In keeping with previous units, the magnetic front cover comes away to reveal the five 3.5in bays, all of which are tool-free for quick and easy disk replacements. 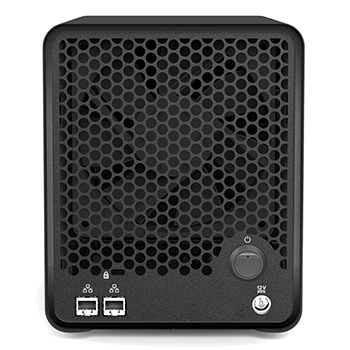 You will need to source 2.5in-to-3.5in drive trays should you choose to use disks of the smaller form factor, and the lack of buttons, ports or accessories highlights Drobo's keep-it-simple approach. There are no external storage ports of any kind, ruling out eSATA expansion, USB backup, or quick copy from an SD card, and there is no option to connect to an HDMI display for direct-to-screen media duties. Drobo 5N2 isn't as feature-packed as, say, a price-comparable unit from Synology or Qnap, but the ease of use could be of more importance to users seeking robust data storage with minimal fuss, and for added peace of mind an internal battery is at hand to allow for data to be written to disk in the event of a power outage. 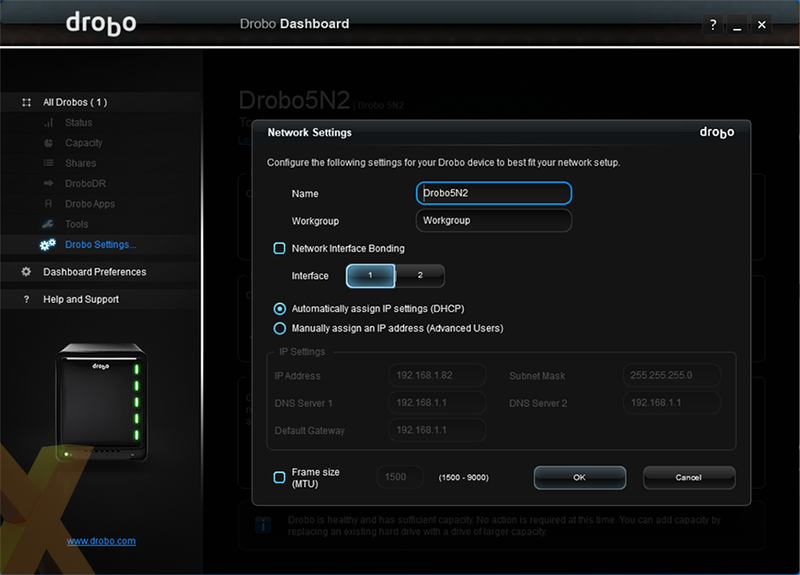 Getting up and running is as simple as attaching the external power supply and network cable, inserting disks and powering on, and we like the way Drobo uses a traffic-light system to let you know what's happening. A green light indicates a healthy drive, yellow means Drobo is 85 per cent full, blinking green and yellow occurs when data layout is being optimised, and blinking red highlights a failed drive in need of replacement. At the bottom of the front panel, a row of 10 blue LEDs also highlights the amount of capacity used, from 0 to 100 per cent. The lights do a good job of providing at-a-glance status information, but do note that the Drobo doesn't issue audible prompts, as is the case with most rival NAS solutions. 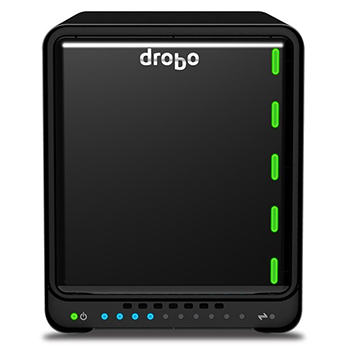 Continuing the less-is-more theme, Drobo's software solutions are particularly easy to get to grips with. 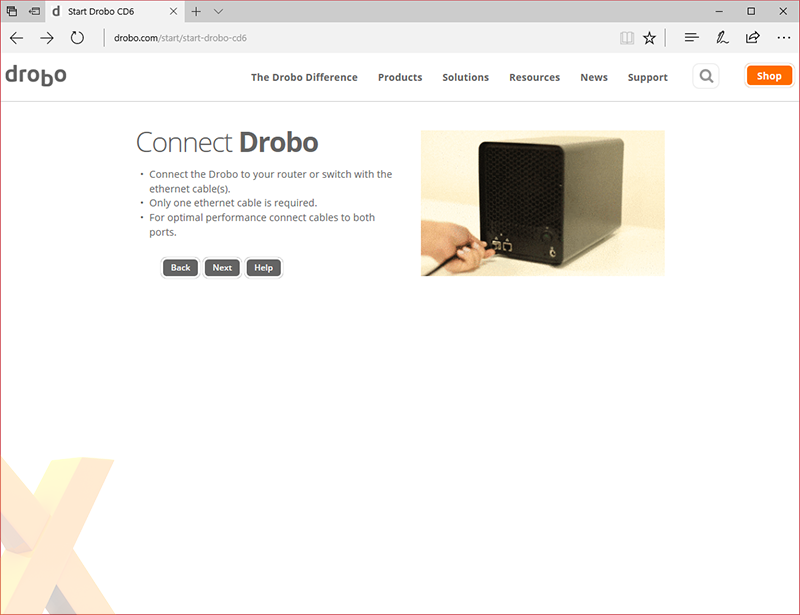 A web-based wizard guides the user through the initial configuration - complete with cute gifs on how to connect the power supply and Ethernet cable - and the last step entails downloading and installing the Drobo Dashboard utility. Well-laid-out and intuitive to navigate, the Dashboard is the one-stop destination for NAS management. 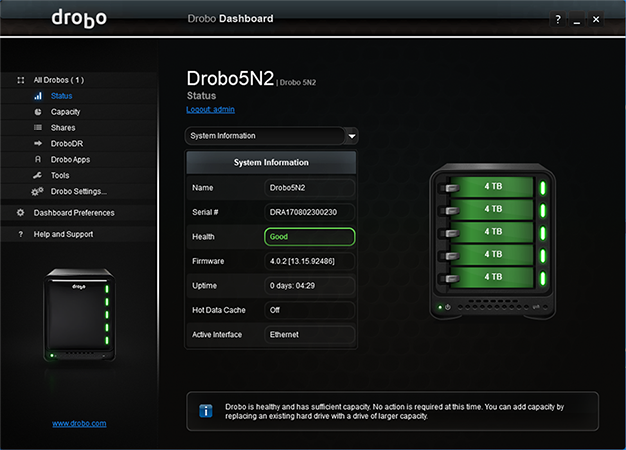 The default status page provides system information, clicking on capacity provides a detailed breakdown of how your storage is being used, and via the DroboDR tab it is possible to pair a second Drobo 5N2 for off-site synchronisation of all data and user accounts. 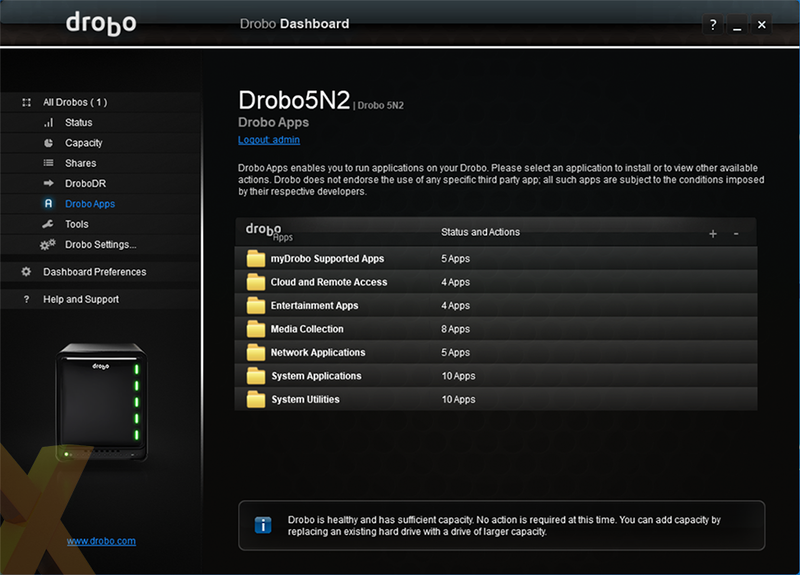 Drobo's catalogue of available apps has grown to include popular choices such as WordPress, Plex and a DLNA media server, and though the overall software experience isn't as versatile nor wide-ranging as Synology's DSM or Qnap's QTS, the Dashboard is accessible to users with no prior networking knowledge. Two essential apps include DroboPix, for automatic uploading of photos and videos from Android or iOS, and DroboAccess, for remote access and sharing of content via a personalised URL. Think of the latter as your own personal Dropbox. 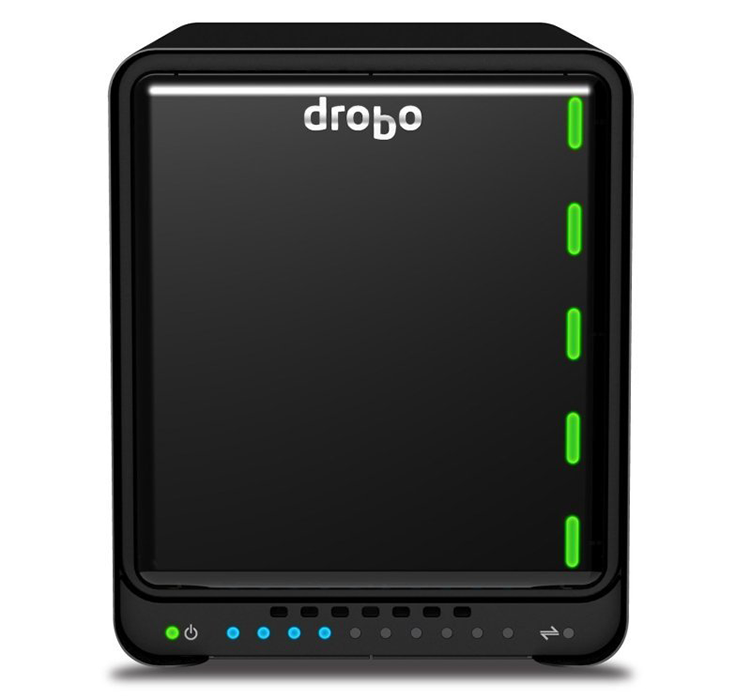 Hassle-free configuration is ultimately what sets the Drobo apart. Configuring port bonding is simply a matter of ticking a check box, and so too is switching between single- or dual-disk redundancy. Protection against a single drive failure is the default, but switching to dual-disk redundancy is a piece of cake and the storage volume remains accessible with hardly any impact on performance while the array is reconfigured. The flexibility is a genuine attraction. 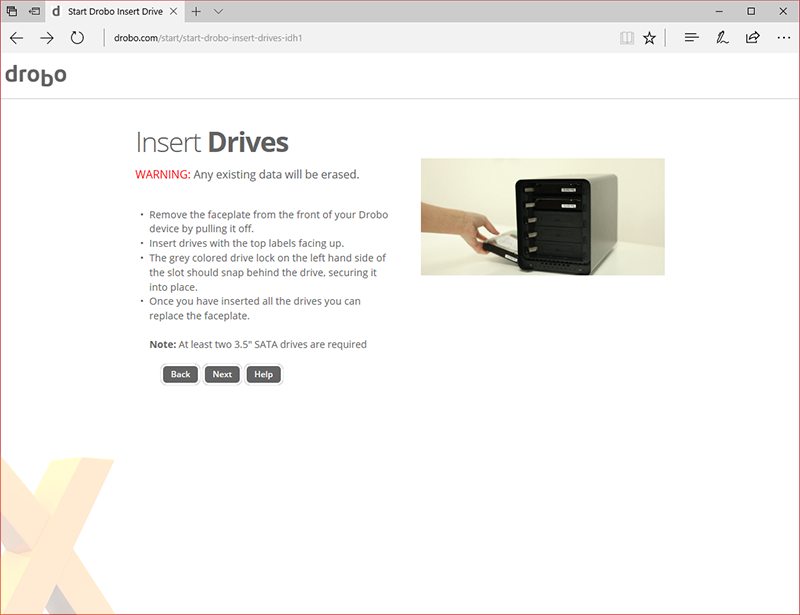 We initially configured our review sample with three 4TB WD Red hard disks, plus 1TB and 2TB disks from Toshiba. The Drobo had no quibbles in using mixed-capacity drives to create a 10TB volume, and we were able to eject the Toshiba disks and upgrade to 4TB WDs in a matter of minutes, taking the total capacity to 14TB when protected against a single drive failure, or 11TB with dual-disk redundancy. 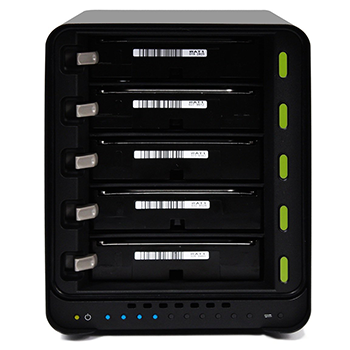 Users with mixed-sized drives can use Drobo's handy online capacity calculator to see how much storage space can be derived from a particular configuration, but while BeyondRAID is very clever, the way it works is such that the Drobo's capacity will always show as the maximum 64TB in Windows, meaning you'll need to refer to the Dashboard to keep an eye on actual capacity and usage.